Come Wednesday next week, the world remembers once again the terrible events about 12 years ago: September 11. Is our world a safer place since that fateful day? Are we more assured that the future will be better than before? As I read the news, there seems to be one bad news after another. The Middle East tensions continue to rise, and this is not just between the Palestinians and Israel. Nations are now talking about punishing Syria for using toxic chemicals on their own citizens. Egypt is still going through a leadership crisis. The Americans have started to withdraw non-essential personnel from their embassies in Lebanon, Turkey, Iraq, and other countries in the region. Remember too that technically, there still war going on in Afghanistan and Iraq. Foreign troops remain on the ground. Will there really be peace on earth? Whatever happened to that Christmas hymn where many all over the world sing about? "Let there be peace on earth....."
There is a difference between truce and true peace. Maintaining a truce is basically putting down arms temporarily. At the Korean Peninsular, the two Koreas remain technically at war. Security patrols remain high at the border, especially the Korean Demilitarized Zone (DMZ). While the 250 km long buffer zone remains demilitarized, there is a heavy military presence on both sides of the border. All it takes is for a freak event and war can be re-started. Until a peace treaty is signed, there is no peace, only a terse ceasefire. Even in marriage relationships, couples can remain married without them talking to each other. All it takes is a silly mistake and all hell breaks loose. We can have enforced peace on the outside. We can even insist on quietness in our surroundings. Yet, these are no guarantee of inner peace. For true peace must come from within. That begs the question. How can peace be present in the inner man? I remember the powerful words of Fanny Crosby in the hymn, "All the Way My Savior Leads Me." True peace comes from heaven. True peace is never found on earth. We can sing about it. We can talk about it. However, when it comes to realizing it, it cannot simply appear in the vacuum of the human soul. For we are empty people. We are needy people. We are people who need help. God's help. Unfortunately, the pride of man has refused the grace of God. In doing so, we turn away from the Giver of Peace. That sets us toward the path of war and destruction. Without God, there can be no peace. Without God, there is no comfort. Without God, there is no hope for everlasting peace. Recently, a friend of mine happens to be at a multi-religious event at a prestigious university in England. Key representatives of various religions were present. Despite the differences in theological beliefs and convictions, there participated in dialogue and religious conversations. While there are disagreements on how they see life, there are agreements in terms of eating food together, having fun together, and to develop friendships together. While these do not necessarily lead to peace, it is a good start. For the underlying belief in conferences like the one in Cambridge is that, in order to prevent war, there needs to be greater understanding among different people. It comes from regular gatherings and open conversations. Once people become friends, they will not fight each other. Once they become brothers and sisters, they will instead fight for one another. Peace comes when we let humility lead and guide us, to be people willing to learn. Peace comes when we refuse to insist on us being more "right" than others. Peace comes when we learn to put the interests of others above our own. 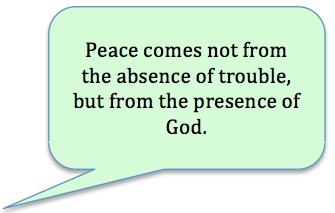 For Christians, peace comes not from the absence of trouble, but from the presence of God. 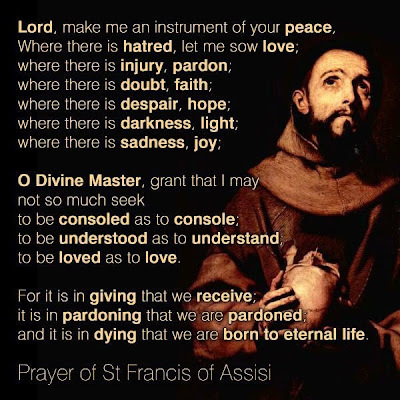 As I think about peace, I cannot help but be gravitated toward this prayer of St Francis. I think it fits in very well for us who desire peace. Peace must begin with us. As we approach September 11, may this be a reminder once again, that peace must begin with us. It must come from the Lord. It must be freely received and freely given.